For more than twenty years, Thomas has served in education as a teacher, coach, principal, and adjunct college professor, as well as an educational consultant for school districts, textbook publishers, and the South Carolina Department of Education. He regularly conducts professional development training in educational design, curriculum development, and instructional methodology at the local, state and national levels and helped establish Edutopia's Social Studies Group page at edutopia.com. Thomas currently serves as the Upper School Principal and Vice President of Shannon Forest Christian School and as an adjunct professor of Education at Furman University. In 2007, in cooperation with Lucasfilm, Ltd., he and long-time friend Wes Dodgens created "Adventures in Learning with Indiana Jones" (indyintheclassroom.com) which provides teachers with interdisciplinary curriculum and lesson ideas based upon the iconic film hero. 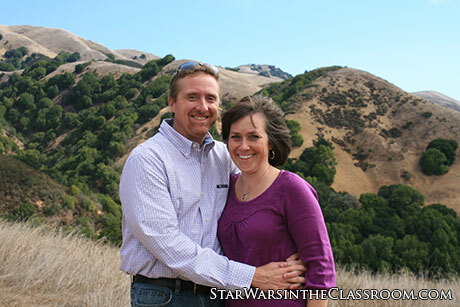 In 2012, Thomas and Wes launched a companion project, "Star Wars in the Classroom," providing inspiration for lessons in history, language arts, science, and the arts. Thomas has been active in promoting social studies education throughout his career and, to that end, has served on the board of directors for the South Carolina Council for the Social Studies and as president of the South Carolina Social Studies Coordinator's Association. As a supporter of historic preservation and public history, he has been involved in numerous historic preservation projects including serving as leader of the only History Channel-supported Save Our History Project awarded in South Carolina. In 2012, he authored the South Carolina 6th Grade (Ancient History) Standards Support Document that provides the essential content for all students taking this required course. 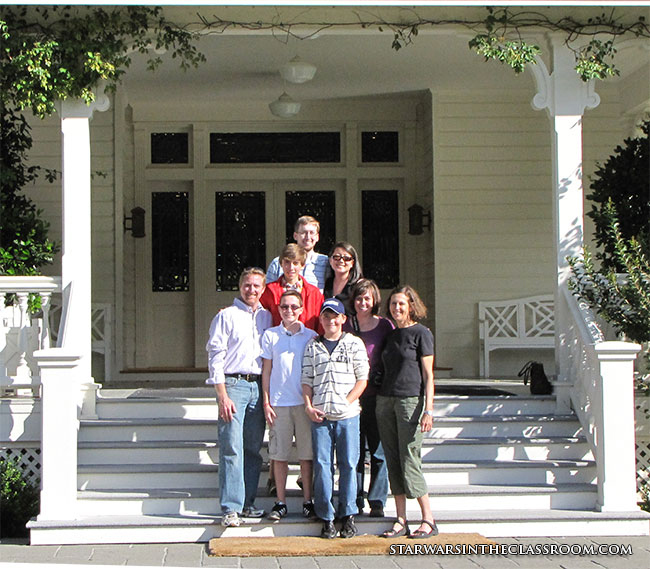 Thomas' "first shift" job, however, is serving as husband to a beautfiul wife and father to three amazing sons. I was 8 years old when Star Wars was released in 1977, a wonderful age for seeing it for the first time on the big screen. When the film began, I remember reading the words, "A long time ago in a galaxy far, far away..." and then this massive explosion of music. I still remember trying to keep up with reading the opening crawl and then...everything changed. A planet, a spaceship racing towards it, and from the top of the screen, this massive machine that kept growing and growing until it covered almost everything. Laser blasts! Explosions! Talking robots, (no one knew the term "droid" then)! Men rushing through hallways to take their postions, and a brave man who looked determinedly ahead. "This must be the hero," I thought to myself. Seconds later he, and most of the other soldiers were dead, blown away by these guys in white armor. I had no idea what was happening. "Good guys wear white, so these must be the good guys," I thought. As quickly as it began, the fight was over and through the smoke of battle, in walked this hullking figure in black. "Wait, these guys work for HIM; they're the BAD guys! The good guys just lost! What?!" And just like that, I was sucked into an adventure unlike anything that I, or anyone else for that matter, had ever seen before. A boy, a princess, an old man, and a pirate with Bigfoot as his friend. Wierd creatures, super cool spaceships, lots of action, a giant battle at the end, and the heroes won medals for their bravery. What more could an eight-year-old want from a movie? It was over way too fast and as we walked out of the theater, I'll never forget my dad looking at me and stating unequivocally, "There'll be another one." I said, "No there won't. Why do you say that?" "Because," he said, "Darth Vader got away." Thus began my life-long fascination with Star Wars. 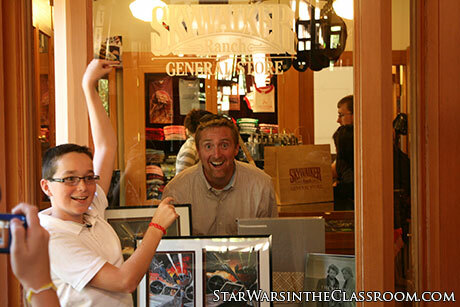 Looking back, it's easy for me to see the impact that the Star Wars franchise had on my life. After seeing the film (several times), I developed an interest in reading legends and myths, science fiction and fantasy, and any type of action-adventure stories that I could find. As an only child, I developed a very active imagination from playing hours-on-end with my Kenner action figures, playsets and spaceships. I also developed a love of orchestral music born out of listening to John Williams' brilliant score for the film and my interest in art began with constantly drawing my heroes in action. It was a great time to be a kid! When I became a teacher, I discovered early on the importance of making learning engaging and relevant to my students' lives. Star Wars (and Indiana Jones) has helped accomplish this. Over the years, I've used both franchises to teach numerous topics, but my favorite is to use the Star Wars saga in teaching mythology to students in world and/or ancient history courses. The lessons we explore are based on the concepts of Joseph Campbell's "Hero's Journey" as found in The Power of Myth and The Hero with a Thousand Faces. Mary Henderson's Star Wars: The Magic of Myth was very influential as well. As part of this study, we watch the Original Trilogy over the course of a school year. At the beginning of the year, as we study the signficance of storytelling and the oral tradition, we watch A New Hope. We identify the mythic elements of "The Call to Adventure" and compare the archetypes found within this section of the story with others that students are familiar with. Around mid-year, as we study the history and culture of ancient India and China, we watch The Empire Strikes Back, specifically to make comparisons between the concepts of Taoism and the Force (Yoda is a terrific example of a Taoist sage) and examine the second stage of the Hero's Journey known as the "The Dark Road of Trials." Finally, we watch Return of the Jedi after studying the rise and fall of the Roman Empire. Terrific historical connections to be made here and we also complete our application of Campbell's motifs to this final chapter of the story. By the time that our study is over, students have critically examined twenty-six mythic elements that are found within three stages of the Hero's Journey. Their final assignment is to apply each of those elements to their ives and explain how they are on their own heroic journey. For many, this assignment forces them to take a long, hard look at themselves. Who are your "hero partners" and who is your "wise and helpful guide?" What is your "magic talisman?" What are your "heroic deeds?" What "masks" do you wear and why? What is your "monster combat" and what will be your "final victory?" For some, this becomes a cathartic experience, discussing for the first time issues that they are struggling with. For all, it's a chance to see themselves as the hero's that they already are or hope to be. Beyond the Hero's Journey project, my favorite use of Star Wars to date has been in the creation of three very successful interdisciplinary and interactive exhibitions called, "Star Wars: Science, Myth, and Imagination." To learn more, just follow the link. More information about our next event will be coming soon! 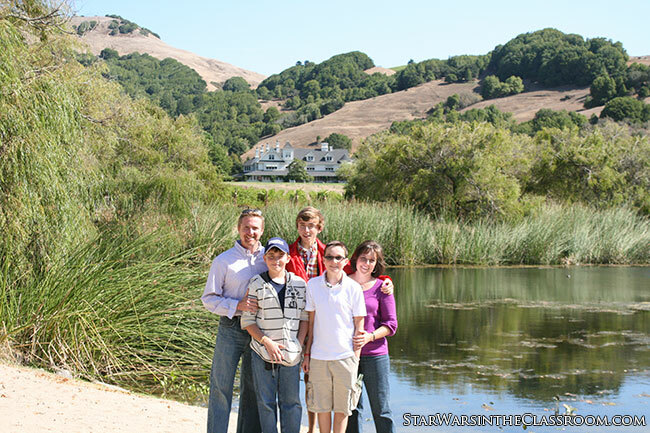 In 2010, Wes Dodgens and I had the privilege of being invited to the "Star Wars Holy Land," Skywalker Ranch! 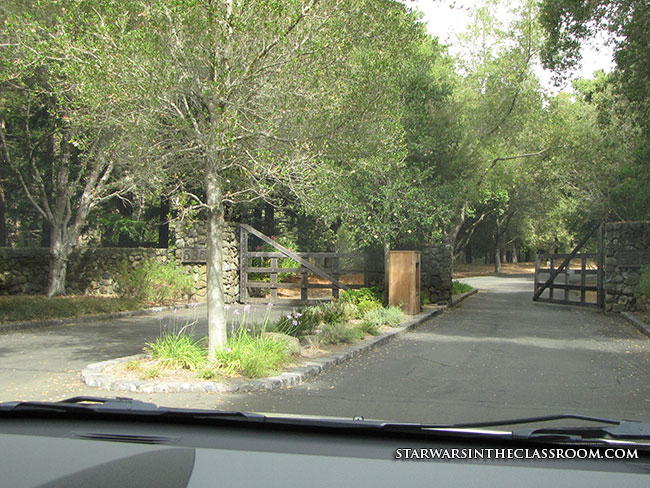 Sharon Wood, the former Head of Documentaries at JAK Films (the production division of Lucasfilm) was kind enough to invite us to the Ranch where she graciously spent the day showing us and our families around. The highlight of the trip was bumping into George Lucas in the Ranch's kitchen! We'll save that story for another time. 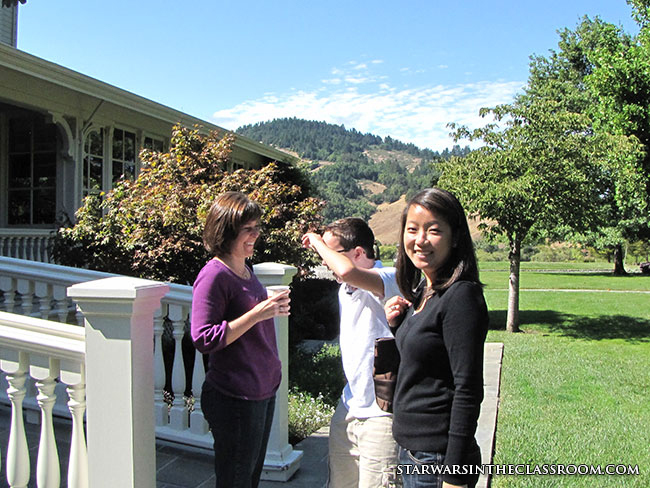 Angela, Nick (Thomas' wife and son, respectively) and Megan are excited to have just bumped into George Lucas! 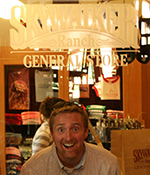 Thomas is excited to be in the Skywalker Ranch General Store where he just spent his son's college tuition money on Ranch merchandise.